Captain Joseph Sellwood’s title was earned not in battle nor behind the wheel of a Great Lakes steamer, but in the mines of Cornwall, England, Michigan’s Upper Peninsula, and Minnesota’s Iron Range. Sellwood was born in Cornwall in 1846 and, with very little formal education, went to work in nearby copper and tin mines as a helper by the time he was 9; at 14 he was earning full miner’s wages. He arrived in the U.S. in 1856 and briefly worked in a New Jersey iron mine before moving on to the copper mines of Michigan’s Upper Peninsula in August 1865. In 1870 he switched to iron mining, working for the New York Mining company in Michigan and at the same time began taking on contracts for ore extraction on the Gogebic Range. After partnering in several mining operations in Michigan and Minnesota, Sellwood moved to Duluth in 1888. He explored the Vermilion Range and opened the Chandler Mine at Ely. In 1892 he became vice president of the Minnesota Iron company. By 1898 he was in charge of every mine owned by the American Steel and Wire Company. When Andrew Carnegie and J. P. Morgan announced the creation of U.S. Steel in 1901, Sellwood struck out on his own, investing in developing mines. Over the course of his career, Sellwood owned interest in twelve mines and a steamship company; presided over the Cass Mining Company and the Bradford Mining Company; acted as vice president of the Duluth & Iron Range Railway; served as president of his son-in-law’s Leithead Drug Company (later Northern Drug); and was president of Duluth’s City National Bank, the Bank of Ely, and the Bank of Two Harbors. Despite the implications of his success, things hadn’t all gone well for Sellwood during his rise. Only three of the six children he had with his wife Ophelia lived to adulthood, and Ophelia herself died in 1903, shortly after Sellwood had cashed in during the formation of US Steel. Life marched on for Sellwood. Between 1902 and 1907 he built two luxurious homes adjacent to his own opulent 1889 Queen Anne mansion at the intersection of 18th Avenue East and Superior Street—one for himself and one each for his two daughters and their husbands. In 1906, the American Ship Building Company had launched the Joseph Sellwood, a 525-foot steel-hulled ore carrier. Sellwood decided to invest part of his fortune into some real estate, in particular an office building that would also house his bank. 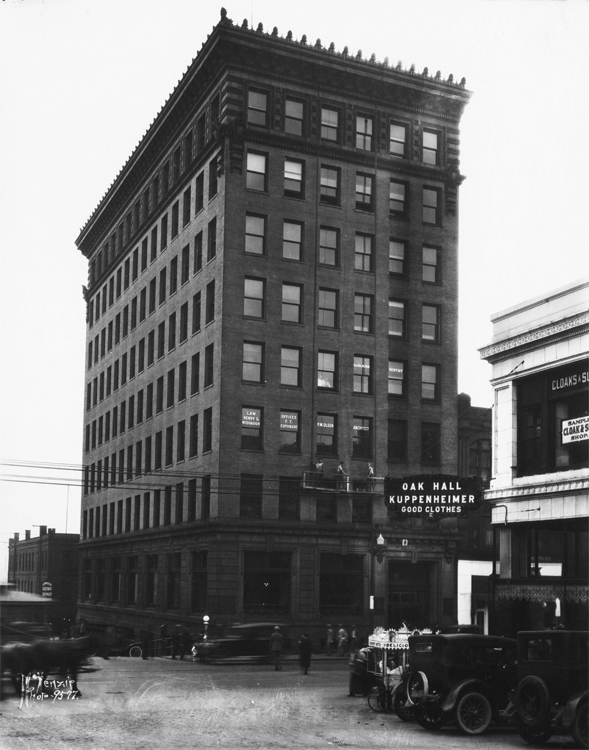 The next time the newspaper reported on the building, it had grown to eight stories above Superior Street and nine above Michigan Street. The story also explained that Sellwood had spent up to $20,000 of his own money helping tenants of the Merchant’s Hotel find new places to live. He hired local architect William A. Hunt to design his building, which was expected to cost $150,000. By November 1907 work was well underway—and trouble began to brew. Sellwood had hired the American Bridge Company to erect the building’s steel frame, and this did not please union laborers working for local general contractors McLeod & Smith: American Bridge was a non-union shop and union men working for Leod & Smith refused to work with non-union men. None of the crew American Bridge sent from Chicago belonged to a union. On November 20 union men hired by McLoed & Smith declared they would strike unless American Bridge was removed from the project, and later that day 100 men employed on the building went to the picket lines; bricklayers and stone masons stayed on the job. The strike began to spread, also affecting construction of the new Clyde Iron Works facility in the West End, where American Bridge was also erecting the steel frame. The Building Trade Company made it clear that it had no quarrel with the general contractor. On November 26 the Duluth Builder’s Exchange told newspapers that if the union men did not return to work the next day, they would be replaced by non-union labor. Meanwhile, the steel framework was scheduled to be complete by the second week in December. On December 3, those union men working in the building trades who did not abandon their stance—a group estimated to be 1,500 strong—found themselves locked out. On the 5th the Duluth News Tribune reported that the steel frame was going up quickly. The labor strife continued for the first few weeks in December. Labor leaders arrived from Chicago to attempt to end the dispute. There was some trouble. William M. Burgess, owner of the Burgess Electric Company, was arrested after he allegedly pulled a gun on union representative M. J. Harvey when Harvey refused to leave a job site. (Burgess was later acquitted). On the 21st, contractors told local newspapers they had won; Duluth building trade businesses would henceforth all be open shops—if union men wanted to work, they could, but they would have to work side-by-side with non-union labor.